Although our DVD plan has ended, Netflix allows you to keep your DVDs out for a limited time before sending them back. Currently, we have Captain America: The First Avenger and one of the Batman: The Animated Series DVDs. By Saturday, we should be done with these and ready to send them back. Then, our mail will no longer see any of those little red envelopes. Part of me is really sad about this. 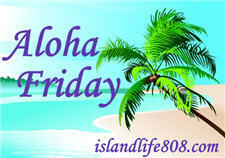 My Aloha Friday question for today is: Do you subscribe to a DVD rental service (either Netflix or some other? If Netflix, has the recent price increase made you change your subscription? P.S. Happy 111111 Day. Or, if you know binary, Happy 63 Day! P.P.S. If you haven’t already, go visit FollowerHQ and let me know what you think of my Twitter application. I was a Netflix subscriber years ago but bailed way before the price changes. I do not rent DVDs as we normally get to watch movies online or via cable. We are long-time Netflix subscribers. While I wasn’t happy with the price increase, I still think it’s a good value. You cannot beat the selection of movie titles on Netflix and I love that you can keep the DVD’s for as long as you want. They have a huge selection of foreign films, which is a favorite genre of mine. We subscribe to both the at-home DVD and the streaming. Kari recently posted..Aloha Friday – Warm Me Up! We were subscribed to Netflix but I cancelled after the change. Irked me big time. We cancelled Netflix all together. We didn’t like the way they went about the changes.